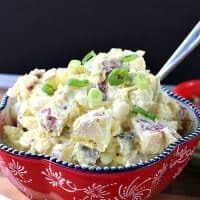 I’ve been making potato salad recipes for years and this is by far my favorite of all. 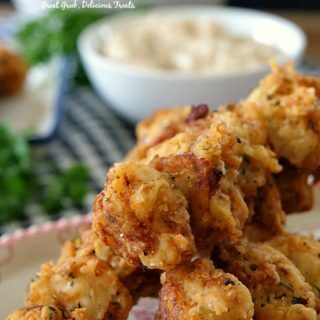 So creamy and a delicious recipe to share with others. 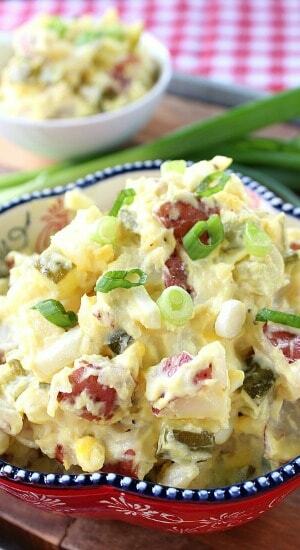 This red potato salad recipe is perfect for summer barbecues and family gatherings. 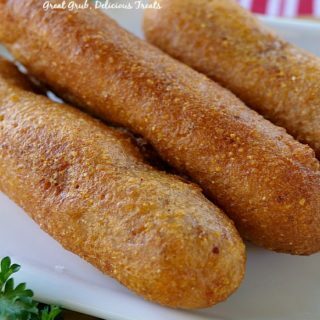 Serve this tasty side dish along with BBQ steaks, burgers and hot dogs. 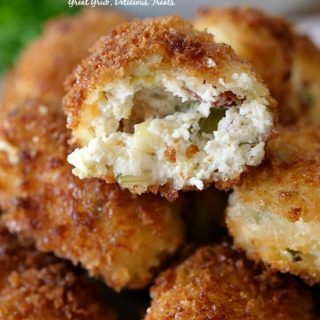 A perfect potluck dish as well. 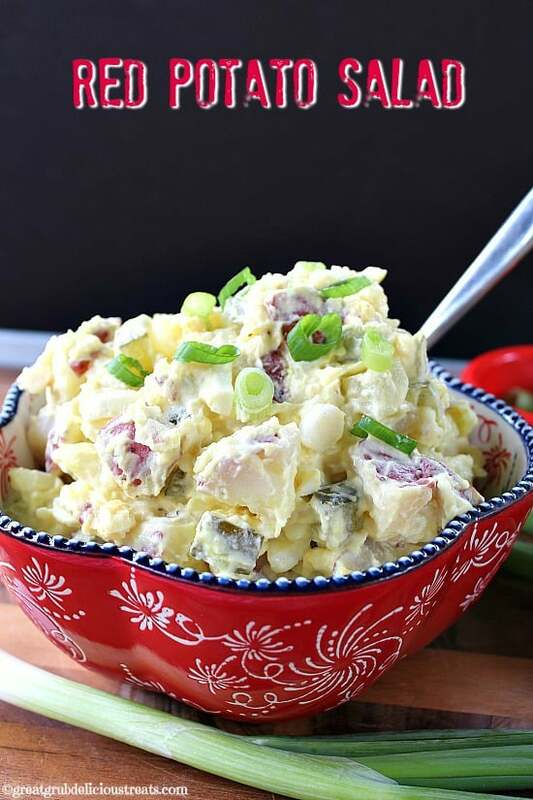 This red potato salad is super delicious, loaded with soft, creamy, red-skinned potatoes cut into small bite size pieces, small chunks of dill pickles, chopped hard-boiled eggs and delicious red onions all mixed together in this classic potato salad recipe. 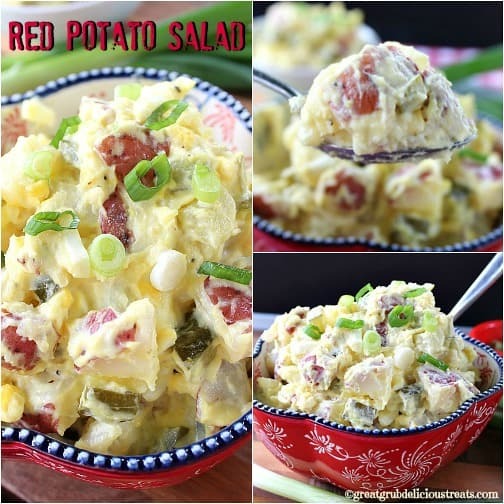 Using red potatoes in this salad definitely makes a difference in the texture. 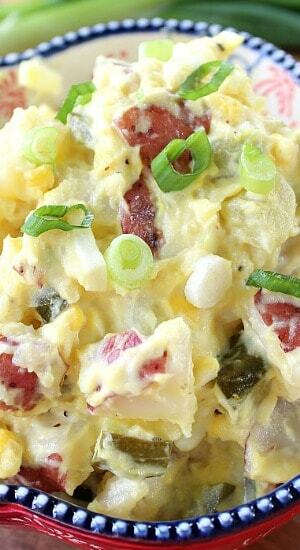 The creaminess and the taste, along with the rest of the ingredients gives this potato salad the best flavor. 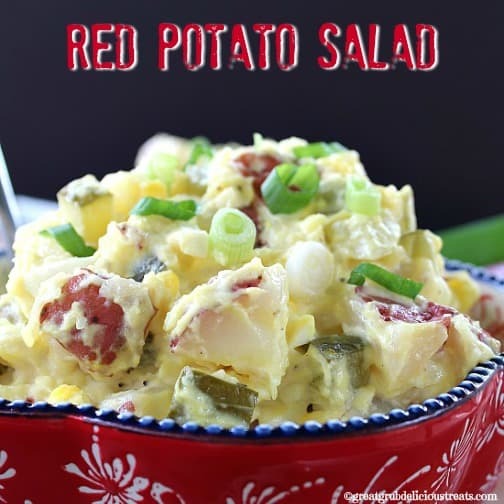 All together, the ingredients each have an important part in this recipe, complimenting the flavor of each other and making it one of our favorite potato salads ever! Just look at this bite! Doesn’t this potato salad look like it belongs along side a delicious burger? 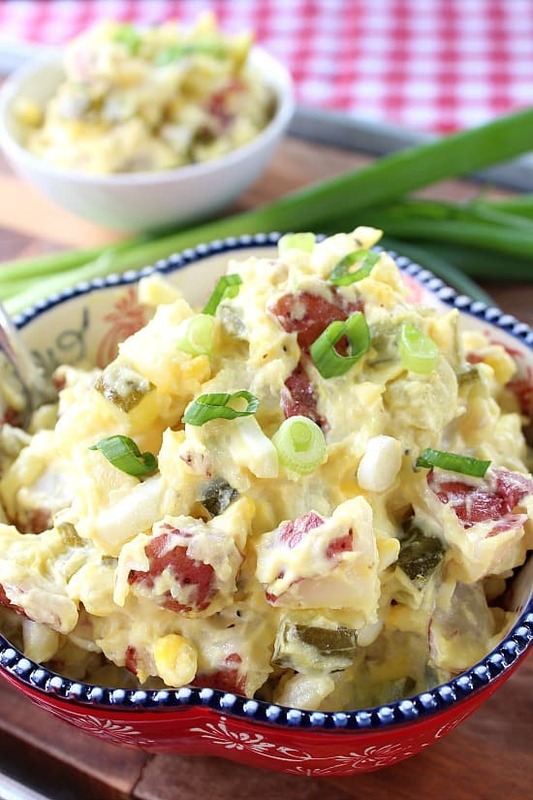 With the weather changing and becoming nicer, this is the perfect potato salad recipe to make this weekend for you and your family to enjoy. 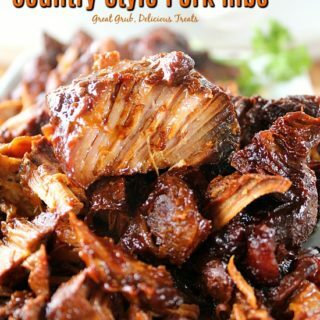 A great summertime recipe perfect for Memorial day, 4th of July, and Labor Day, actually it’s great anytime family and friends gather together to enjoy great food. Usually we have leftovers for quite a while but not this time. It’s so good it was gone in just 2 days and it was just the two of us. 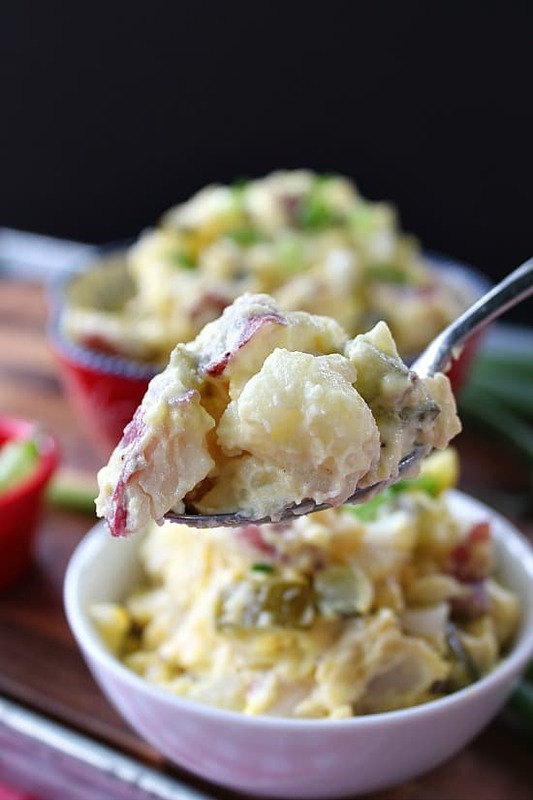 Definitely a classic summer recipe with these delicious red-skinned potatoes, along with the crispy, crunchy dill pickles, red onions, and perfectly hard-boiled eggs all mixed together with mayonnaise and a couple squirts of mustard, seasoned with salt and pepper and then topped with green onions. 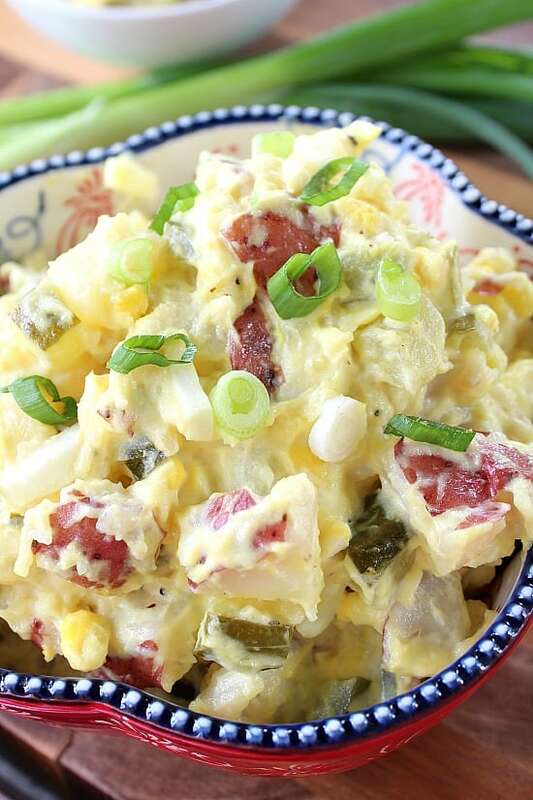 The next time you are going to make potato salad, save and remember this recipe. You will be so happy you did! Here are a couple other delicious salad recipes on the blog that you might also enjoy: vegan potato salad, avocado potato salad, macaroni salad and chipotle macaroni salad. 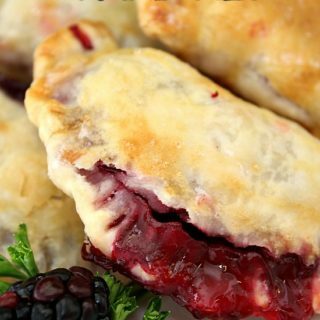 A classic summer recipe which is incredibly delicious and a family favorite. In a large saucepan, cover potatoes with water, bring to a boil and cook on medium flame until fork tender. About 20 minutes. Once cooked, drain water and set pan back on the stove to let potatoes cool a while. Boil eggs while potatoes are boiling. Drain and rinse with cold water. Cover with cold water to continue cooling the eggs until ready to use. In a large mixing bowl, place chopped pickles, onions, mayonnaise, mustard, salt and pepper. Stir. Add chopped eggs into mayonnaise mixture, stir until combined. Cut each potato into small bite size pieces and place in mixing bowl. 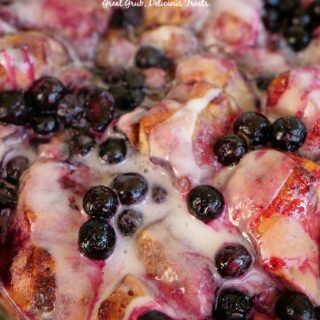 Gently mix until well coated. Place in refrigerator until chilled completely.